Some of you may have noticed that my blogger profile has read “Future Maine Guide” as my profession for well over a year. This was done, in part, to motivate me to begin the preparations required to work toward my Maine Guiding Certification. 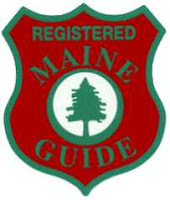 After many years of dragging my feet, I have finally managed to make the commitment to getting certified as a Registered Maine Guide. Last week, I took a vacation day and drove to the Red Cross headquarters in Portland, where I completed the required first aid credentials. While there, for the fun of it, I also received a refresher on my infant and adult CPR rating. While not required for the Maine Guide registration, I thought it was a valuable skill set to know (especially with two active little ones). This small initial step, allowed me to complete the short two page “Maine Guide Application” document that I immediately submitted to IFW to get my testing date organized. For those of you who are unfamiliar with the process of becoming a Maine Guide, it starts with a battery of oral and written testing. The oral test, done before a small group of Master Maine Guides, is the most difficult part of the testing equation. These experts question candidates on a variety of woods and waters related scenarios in order to judge their ability to safely and effectively guide in the state. Two distinct sections highlight the oral exam. The first is navigation and the second is the lost person scenario. Failure to perform to high standards on either of these portions will result in immediate disqualification and the candidate must reschedule. Bye, bye thanks for playing but please move to the end of the line. With my application now kicking around in the inbox at IFW I am now growing increasingly “anxious”. In an attempt to quell my anxiety, I spent about two hours last night pouring over several dozen pages of notes, comments, and suggestions that were provided to me by others “guiding” family members. This review was followed by a 50 minute telephone conversation with the old man who provided me with even greater insight on the lost person scenario and specifically what I should be expected to receive for questions. See Dad received his Maine Guide endorsement a few months ago and I am fortunate to have his experience in that endeavor working on my side. I suppose I am beginning to feel more comfortable with the process and have reorganized some of his notes into a format that fits more with my minds eye. This entailed transferring most of this hand written notes to my Black Berry and greatly shortening some of the dialog to simple reminders. Well better get back to studying, as according to IFW I may only have a month or so left before I get my test date! Wish me luck! Good luck and I hope to hear the final results. Sounds like you are on your way! Good Luck to you and best wishes for the highest scores! Keep plugging away! The more you study, the better prepared you will be when they get to you! Thanks all! I will drop updates as I move through the process. Have also had a number of questions offline on what it "means" to be a Maine Guide and what the value is in holding the credentials. Will certainly add a post offering some explanation. Really glad to have stumbled on your page. I'm currently in the process of training as a guide and outdoor educator and the studying process for the Maine guide exam is certainly overwhelming. I'll definitely be reading through your updates for insight along the way. Hi Chris, Glad you enjoy the blog! Good luck on the Maine Guide test! The test is a lot of studying but in the end it is a fantastic accomplishment! Please keep me posted on your progress.